Stunning visually and sonically, the Egg 100 package isn't cheap, but sets the bar for compact nearfields. Lovely stereo imaging. Factory matched speaker and amp system. Flexible nest stands. 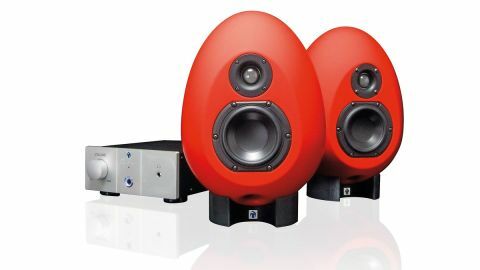 Sonic Distribution's joint venture with acoustic whizz Andy Munro first produced the Egg 150 Monitoring System, their eye-catching, minimum diffraction, egg-shaped monitors. Their second outing scales things down, and the Egg 100 is both smaller, simpler and cheaper. But the overall concept is fundamentally the same, namely a pair of high-quality passive monitors coupled with a separate custom-built dual channel Class A amp and control unit, all constructed in the UK. The system is sold as an integrated package and also matched at the factory, and each monitor is labelled left or right to ensure correct hook up. "Overall the sound is very open and, although there's a slight mid range presence, it doesn't dominate"
Connections between amp and speakers are via an included pair of two metre Speakon equipped cables (both amp and speaker use Speakon connectors), and audio inputs are via a single pair of XLRs. The amp includes main volume and also a headphone output driven by its own Class A amp (hook up mutes the speakers). HF and LF response can be adjusted via two pairs of screw tweakers on the side of the amp casing, and there's an audio clip LED above the main power switch. The Egg 100 LF driver is a 4-inch (100mm) unit, the tweeter is the same 25mm design as the Egg 150 (with automatic thermal cut out and reset), and the crossover is passive. Egg 100s are available in black, white and red. The speakers are very light (the monocoque shell is made from a polymer) and they sit on curved rubbery egg cup stands called nests. These include a c-shaped cut out at the front to accommodate the downward and forward-facing bass port, and a small cut out at the back to accommodate the speaker cable. The rubbery finish of the monitor casing, combined with the rubbery nests, means the monitors can be orientated considerably without fear of toppling over. The only real limitation is ensuring the bass port sees clear air. As mentioned, the amp includes per channel HF and LF adjustment at 10kHz and 63Hz respectively. At the maximum clockwise position, bass response is flat, and the HF circuit is adding +1dB. For the latter, each 45 degree turn counter-clockwise reduces this by 1dB up to a quoted minimum of -5dB. The bass trim range is from 0dB to -10dB at fully counter-clockwise. To ensure accurate settings you'll want to look at the trim pots when adjusting, and their rather inconvenient position on the side of the amp is clearly a ploy to encourage you to leave them alone once set. If you know your room well and are feeling brave, each channel can be adjusted differently. Overall, the EQ tweakers got us to where we wanted to be, which was pretty flat for the HF and a small trim (maybe 1-2dB) on the LF. "The sound is pretty unforgiving, which is great for monitoring, but also not fatiguing"
In terms of sonics, the Egg 100s have a very broad horizontal sweet spot and, although the vertical sweet spot is narrower (not untypical it's fair to say), you certainly don't feel like you have to stay in one tiny spot while working. Overall the sound is very open and, although there's a slight mid range presence, it doesn't dominate. Low frequencies are clear and punchy and low frequency extension is good for their size. Given the quoted 30W RMS amp output, they're also quite loud. The sound is pretty unforgiving, which is great for monitoring, but also not fatiguing. In part this is down to the excellent stereo imaging, which is wonderfully precise and lays your stereo image out very nicely. Even so, they do lack the depth of field you get with a bigger woofer. The included headphone amp is a nice addition and is way louder than you'll need. The Egg 100 package shows that a low diffraction cabinet design combined with matched and external amp electronics is still a force to be reckoned with and, although conceptually there's nothing that new here, the resultant package oozes quality in so many ways. These are some of best compact nearfields we've tried. And don't take our word for it - Sonic has a free loan service open to everyone.